In this 2-days course, basics of statistics will be described briefly. Then, statistical testing methods in both parametric and nonparametric manners will be practically taught, utilizing MINITAB software (version 18.1). Examples are mostly related to biomedical applications to give the ability to the audience how to choose some tests rather than others. 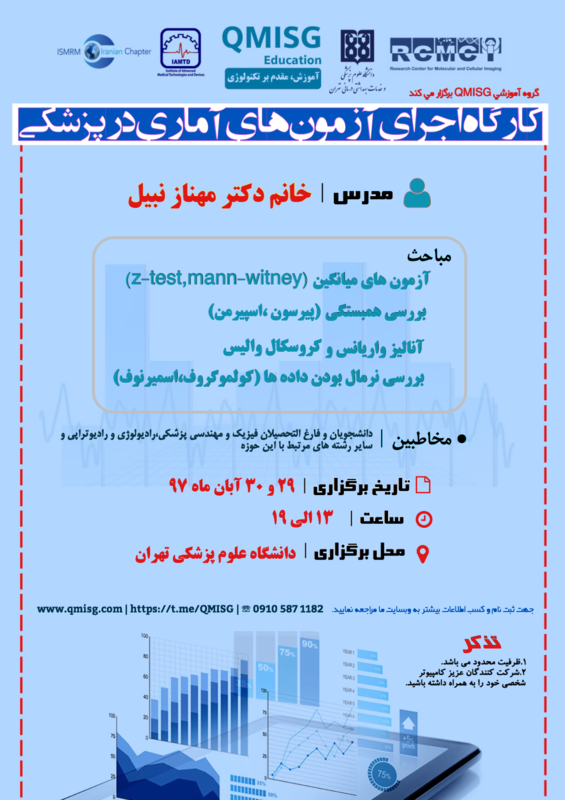 The aim of this workshop is to grow the knowledge of using statistical techniques, as well as obtaining the test results by at least one software. Also, outputs will be discussed to teach attendees how they can gain confidence in the accuracy of results. One of the main concerns in statistical tests is their assumptions. Therefore, checking these assumptions is the most important part of each test which often is neglected by researchers, as the significance is computed based on the correctness of these assumptions. In this course, providing these assumptions is exhibited and if they are not satisfied, the ways of data modification will be taught. Researchers who need to apply statistical techniques in their researches. Assistant Professor of Statistics, Department of Mathematical Statistics, Guilan University. Conference Room, Research Center for Molecular and Cellular Imaging, Kaboli Building, Emam Khomeini Hospital, Keshavarz Boulevard, Tehran, Iran. Cancellation before 10 days from the start of the course is subject to 10% of the cancellation fee, and within 10 days to one day before the course, 25% of the total payment shall be reduced and the rest will be repaid to the applicant. At the start of the course, NO cancellation is possible.